The most festive, joyous, day of the Jewish year is Purim. We are celebrating beginning tonight with the reading of Megillah Esther, which can be read either in a very serious way or in a very raucous way with lots of audience participation. Many will dress in costume as a way to add more celebration and pomp for the holiday, and as a way of recognizing the hidden nature of God in the story of Purim. God is never actually mentioned in the text of the Megillah, though HIS presence is unmistakable throughout the story. Tomorrow will be the big feast, or seudah, in which we revel, drink to excess, and have nothing but joy in our hearts as we sing and celebrate. Some will option to dress in costume again, while others don't observe that custom and will dress in normal attire. I hope you all have a wonderful Purim, and please make sure to drink and eat too much! There have been several developments over the past few days in Israel that deserve attention. Most encouraging of all was seeing rightwing Zionist nationals lead an angry demonstration to destroy the house of the Arab filth who murdered the Yeshiva students. Rav Kahane would have surely been proud of them. 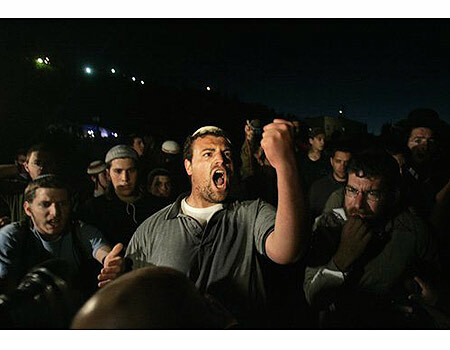 (IsraelNN.com) At least 13 Jews were arrested Sunday in Jabel Mukaber, in southern Jerusalem, after nationalist protesters entered the village to try and tear down the home of the terrorist who murdered eight yeshiva boys 10 days ago. Some time after 8:00 P.M., the police declared the demonstration illegal and dispersed the protesters. One police officer was very lightly hurt. There was damage to property inside the village, including cars and homes. 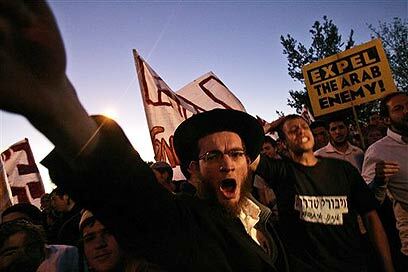 The events began after 5:00 P.M., when hundreds of nationalist Jews gathered at the Armon HaNatziv promenade with the intent of entering Jabel Mukaber and tearing down the house of the terrorist who murdered the Mercaz Harav yeshiva students. The placards announcing the protest were directed against "Israeli Arabs" and said: "The Arab enemy within us, in Lod, Akko and Wadi Ara, and in Jerusalem, supports and encourages murder of Jews." They added: "In the face of the state authorities' inaction, we shall come ourselves and do what needs to be done as representatives of the People of Israel." Several dozen Jews managed to go around the police roadblocks and enter the village. to be done as representatives of the People of Israel." They ended with a Purim allusion: "The opposite shall happen: the Jews shall control their haters." Meir Indor, who heads the Almagor terror victims' group, was among those arrested at Jabel Mukaber. He said: "Tonight's activities showed that if the government of Israel refuses to strike back at the enemy after terrorist attacks, the people of Israel will. The ongoing policy of surrender and concessions is what invites these terrorist attacks against us." In other news, a leading hareidi Rabbi has issued a halachic ruling banning Jews in Israel from hiring Arabs. The hareidim have often been bitterly, and deservedly, criticized by religious Zionists and rightwing nationals for not sufficiently supporting Israel's right to exist as a Jewish State. This is a very welcome move in the right direction. (IsraelNN.com):Rabbi Chaim Kanievsky, considered a top Torah sage of the generation in the hareidi-religious community, issued a Jewish legal decision banning the employment of Arab workers by Jews according to the Yom Chadash daily. The rabbi issued the decision at a meeting with several administrators of yeshivas (seminaries) in B’nei Brak. The administrators each employ an older Arab man who they do not suspect of any involvement in terrorism. The administrators decided, nonetheless to seek halachic (Jewish legal) guidance following reports that the terrorist who carried out the massacre at Jerusalem’s Merkaz HaRav Yeshiva had been hired as a driver on occasion. Asked later if his words should be publicized, Rabbi Kanievsky said: “Certainly,” according to the News First Class site. Rabbi Kanievsky went even further, saying that Jews should refrain from employing any non-Jews, not just Muslim Arabs, and instead grant livelihood to Jews, unless there exists a huge disparity between the labor costs. The rabbi's family told Arutz-7 that the Yom Chadash report is 100% accurate and explained that "although there can be financial justification for hiring foreign workers, G-d forbid should we hire Arabs. We are at war with them." Rabbi Kanievsky is one of the most recognized authorities in hareidi-religious society. He is the son of the Steipler Rebbe, Rabbi Yisrael Yaakov Kanievsky, and the son-in-law of Rabbi Yosef Shalom Elyashiv, the leader of Lithuanian Hareidi Jewry. Next, an 18 year old Jewish girl has been held without official charges in an Israeli prison for over 3 months because she "allegedly pushed an Arab", despite the fact that the ARAB HIMSELF denies the incident ever happened! Well, now she was permitted to have a state approved hearing before the nascent Sanhedrin since she will not recognize the corrupt Israeli court system as legitimate. This is important as it is the first time the secular government offered any degree of recognition to a Torah court. Of course, the secular government assumed the Sanhedrin would rubber stamp their right to imprison this girl indefinitely for no reason, but the government thought wrong. The Sanhedrin ordered her freed at once, but the authorities rejected the decision and sent her straight back to prison despite the court order to honor the Sanhedrin's ruling. In fact, just to prove a point to everyone, they had the poor girl locked up in solitary confinement just to show they are every bit the scum, lowlife traitors we know that they are. (IsraelNN.com) Tzviya Sariel of Elon Moreh, who has been held in jail since December for refusing to recognize the authority of the secular court system, was allowed to testify before a Torah court set up by the nascent Sanhedrin Friday. The Sanhedrin Court for Matters of People and State ordered her immediate release. The Court For Matters of People and State also heard testimony from the girl’s mother, as well as Shmuel Medad of the Honenu legal assistance organization. The court concluded that Sariel’s right to refuse to recognize Israel’s current justice system is justified and ruled that the only limitation to the struggle is the ability of each individual to withstand the difficulties of prison. The court also ordered that Sariel be released immediately, without any limitations. "Every day and every hour that Tzvia Sariel spends behind bars is a wrongdoing to this girl," Rabbi Ariel ruled. "Justice demands to release her immediately. It is a serious stain on the judiciary system in Israel. According to the Torah law of Israel, we are demanding her immediate release without conditions and to erase the indictment." Finally, Moshe Feiglin, the runner-up to Netanyahu for head of the Likud Party, has been banned form entering the UK, and he couldn't be happier! I'm sure our leftwing, UK friend Gert will be terribly disappointed to hear about this development. (IsraelNN.com) Moshe Feiglin, head of the Likud’s Jewish Leadership faction, has been banned from visiting Britain. Interesting week. I am so glad to see the spirit of the true rightwing Zionist nationals and Torah Zionists has not been broken by the vile Olmert regime. Interesting. Olmert says he will stop Hamas terrorism the same way he stopped Hezballah...cowardly capitulation! Ynet News: "There are those who are trying to discourage us from the possibility of peace. But we have been through worse times than these," said Prime Minister Ehud Olmert in his first public address since the murder of eight Israeli students at the hands of a Palestinian terrorist in Jerusalem's Mercaz Harav rabbinical seminary on Thursday. "There is a direct link between the Qassam rockets and the terror attack in Jerusalem. Both are intended to make our lives unbearable," the prime minister said at an event in the city of Holon on Saturday evening, "but just as we achieved deterrence against Hizbullah, which hasn't dared to fire a single rocket in a year and a half – so we will achieve deterrence against the terror organizations," he said. Olmert stopped Hezballah from firing rockets by offering them his unconditional surrender. I suppose we can expect him to do the same now with Hamas. You show them who's boss, Ehud! Time for more concessions and good will gestures by Olmert and company. (IsraelNN.com) Israeli security forces have razed the home of the murderous terrorist who murdered eight Merkaz HaRav yeshiva students. He lived in Jabel Mukabar, a neighborhood just east of Jerusalem's East Talpiyot neighborhood. His family set up a mourners' tent outside the ruins, and hung Hamas flags all around it. Police denied reports that the murderous terrorist had once worked for Yeshivat Merkaz HaRav. However, he was a driver who often transported children and others, and there were reports that he had occasionally been hired by the yeshiva. His last trip was Thursday evening to Yeshivat Merkaz HaRav, where his van was found after the attack with ammunition inside. Magen David Adom emergency medical services are on the highest level of alert all around the country. Jerusalem police are out in force as well, especially to guard the Moslem prayers on the Temple Mount - though police commentator Uri Cohen Aharonov said, "The Arabs have basically had their fill for one day, and no disturbances are expected." This horror will make so many liberals feel that if only more concessions and capitulations had been offered this never would have happened. Expect some Settlers and Nationalists to be feeling their wrath in the wake of this atrocity.